The brain should have previously been removed from your cat (see Removal and Study of the Cat Brain). You should identify the upper and lower eyelids, and the nictitating membrane which comes up from below the eye. Note the conjunctival surfaces, and the inferior fornix. Locate the optic nerves where they enter the cranium through the optic foramina. Draw lines from each optic nerve to the medial and lateral limits of the orbits. The accompanying image shows the location of the cut to make. Cut on these lines with the end of a hack saw. Be certain to cut laterally enough to prevent part of the frontal from overhanging, and all the way to the optic foramina. Cut the anterior portion of the eye loose from the socket by cutting closely along the bone to free up the eye itself. Lift up the entire structure, cutting any peripheral tissues which may hold it down. After you have lifted it in the front, slide the scalpel under the rear-most portion to free it from the skull. Note that the nictitating membrane marks the inferior portion of the dissected portion. Note the membrane which surrounds the entire orbit (periorbita). The lacrimal gland is under it on the lateral superior side. Work the periorbita open with a blunt probe, remove the adipose tissue which served as padding. The most superficial superior muscle will be the levator palpebrae superioris, which raises the eyelid. It does not insert into the bulb. 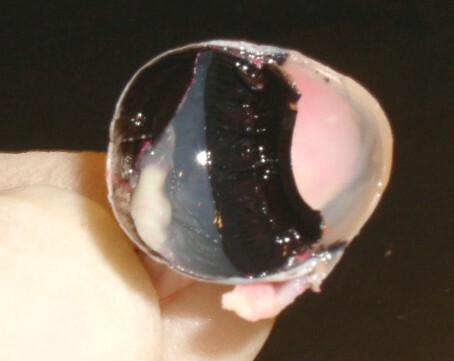 The fat has been removed from the excised eye to reveal the muscles (upper picture). 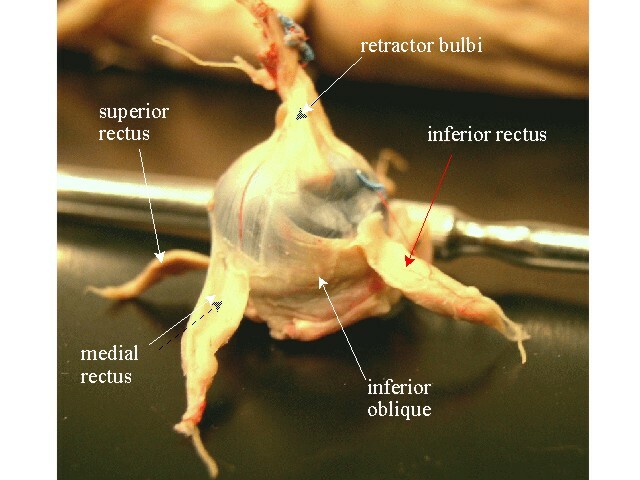 Deep to the four rectus muscles (peeled back in this image) are four portions of the retractor bulbi. Note the optic nerve which exits the eye at the center of these four parts. The four retractor bulbi have been reflected to show the rear of the eye ball. The sclera is opalescent bluish white, the optic nerve at the center. With the fine scissors, make a small vertical snip through the rear wall of the bulb just medial to the optic nerve (do not squeeze the bulb during this cut…). Hold the eye over a petri dish lid, extend the cut (keep it shallow) sagittally through the center of the cornea. Note that aqueous humor drains out as the cornea is being cut. 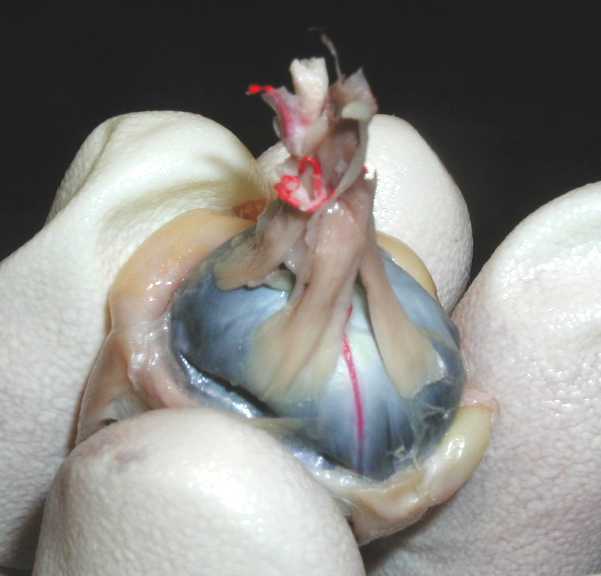 As you lift the cut anterior piece, note that the lens is attached to it by suspensory ligaments. Cut through the iris, and lift off the cut portion, cutting its ligaments. 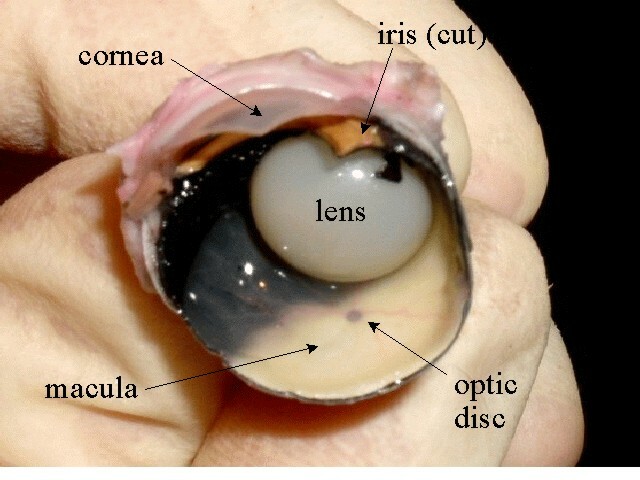 Here is a labeled image of the components of the eye (upper image in left frame). The retina will appear pearly yellow. Note the optic disk identifiable by the vessels may be seen to emerge from it, and pass under the retina. The fovea centralis will be towards the center and seen as a yellowish depression. (Here is a labeled image.) The retina peels away easily from the underlying choroid. This, a detached retina is a serious condition requiring immediate attention in patients to prevent death of the retina and blindness in the patient. 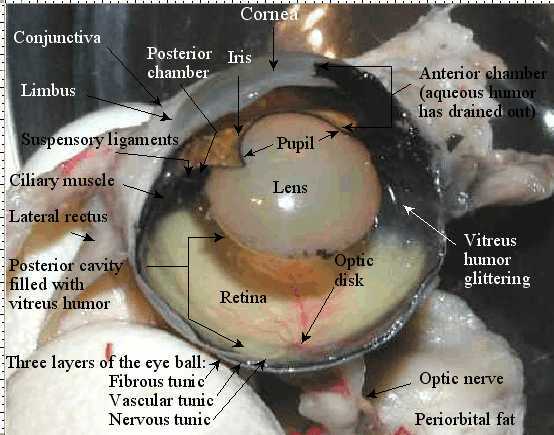 In the anterior portion of the eye, note that the lens is supported by suspensory ligaments. Posterior to it is the ruffled surface of the black pigmented ciliary processes which produce the aqueous humor. The ora serrata is the anterior boundary of the retina. The iris is golden on the exterior surface, black on the posterior. The cornea is tough and relatively thick.